1. First off, we set the date. Obviously without a date there is NO wedding. Josh and I booked our entire date around item #4 below. We will be wed exactly 10 months from today on August 23, 2014 in San Antonio, Texas. I have pretty much always known I would get married in San Antonio. It is the "big city" for me and my fellow South Texans, and I love it! Plus it has a major airport which will accommodate our large group of out of state guests. 2. After we booked number 4 and set the date, we picked our church. Josh and I are Catholic, and we knew we wanted a full Mass. Originally I wanted us to get married at the Catholic Missions in SA. However, logistically they did not work out. Luckily, San Fernando Cathedral was available on our date and we pounced on it. It is going to workout even better than the missions. 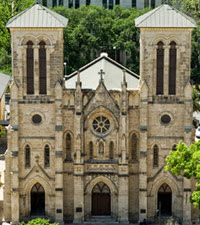 The Cathedral is located right on the Riverwalk making it close to hotels and our venue. 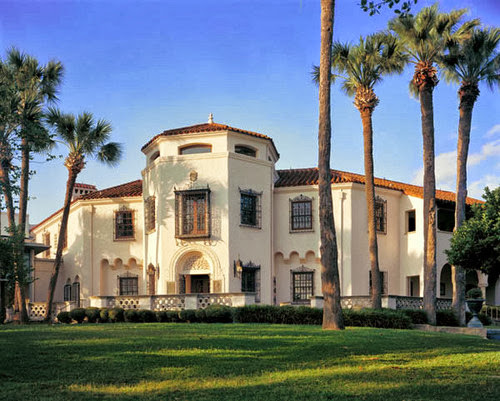 Plus it is beautiful, historical, and the air conditioning works well. That is important when you are getting married in Texas in August! Ay Chihuahua! Hot Tamale! 4. (continued from above) are dancing their hearts out to Blind Date, our wedding band. Josh and I booked our entire wedding around the availability of our band. We heard/saw them for the first time when they performed at my friend Lauren's wedding, and yes I said performed because that is what they do. They give you and your guests a performance! I cannot even describe how great they are. They make everyone want to stay on the dance floor and shake their groove thing all night long, and I can't wait for my reception. I will be on the dance floor the entire time. The Monday after Josh and I got engaged I emailed the group to see when they were available in 2014. There were already booked through July!!! Originally (I have said that a lot today. Be ready to be flexible when planning a wedding) we wanted to get married much earlier. We have been dating for almost 5 years. It is time to seal the deal! However, I knew I wanted this band. So we decided what the heck. We are already waiting for 11 months might as well go for August and do the typical hill staffer* thing and get married then. So that is what we did and I am ecstatic! 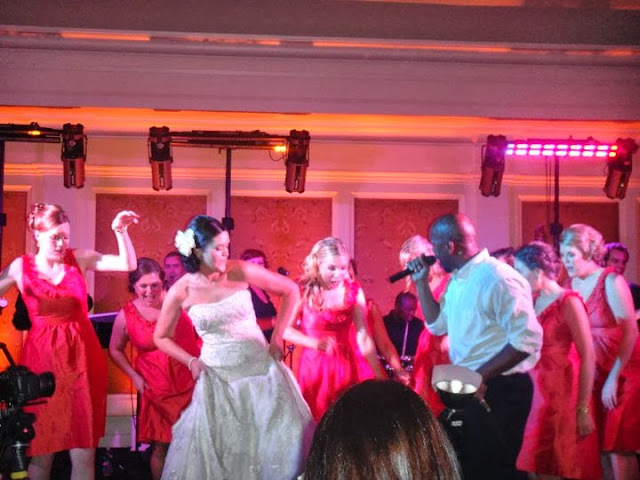 Dancing the night away at Lauren's Gorgeous Wedding. Her wedding was incredible in every detail and I am making a lot of decisions based on what I saw there. Thanks Lauren! *Almost everyone who works on the Hill gets married in August. That is when Members are on District Recess for a whole month so you know that legislatively nothing will mess up your wedding plans. Hill Staffers live a different kind of life. Linking up with Little Bit of Class Little Bit of Sass and Chits and Giggles! You have a lot done! I loved marking all the big stuff off of the list. YAH! YAH for getting your wedding band! WOO HOO! I can't imagine planning a whole day around the band, but that is awesome that you did. It's good to know what you want! LOVE IT! Thank you Kristyn!!! We are really excited. During the Christmas Holidays we hope to get some more of the big stuff accomplished. Thanks for hosting. I look forward to Wednesdays! Oh my gosh, your venue is gorgeous!!! It looks like something out of a movie. I know your wedding will be so much fun because you are! Miss you! Thank you Frannie! I love and miss you! Eeeeeee! I can not wait :) Love you both and know it will be perfect!! So excited for you Livers! Don't worry time will fly by! Yay for the big stuff! And for a/c!!!!! It is crazy! Yall are almost there :) So exciting!!! So excited for you and Josh! I feel so special to be pictured on your blog. Thanks for the compliments. I am going to send this my mom and Becky so they can see it as well. I love the location of the reception. Landon and I had our engagements pictures taken there and it is beautiful. If we got married in SA - it would have been one of the places we looked into. Love you friend! I love you Lauren!!! And I am so so so happy for you and Landon! Congratulations on your wedding plans! August weddings are the best! Rick and I got married in August too and it actually turned out awesome weather wise. You will really love your full Catholic mass and band (live bands are the only way to go in my opinion). The Catholic ceremony was my favorite part of the entire day. xoxo See you on Saturday at Langley!